That time of the day… – Oh, I see! Everyday holds magic and there’s a certain time, that special moment during the day when we feel good about everything. This ‘feeling good’ has nothing to do with external events. It is something that comes from within. That special time for me is in the afternoon. That’s why I prefer walking around the city during this time. I usually sketch at noon or early mornings and I guess my state of mind or mood reflects in my work. While I try to keep the sketch as honest as possible to what I see before me, while painting, a lot of times, if I’m feeling happy, I can’t bring myself to dull the ochre of architecture though I see stains and chipped plaster. Here’s a sketch I had done on my way to Amer. I added a bit of the darkness later. I often find the most interesting scenes/ things to sketch in the most unexpected places. 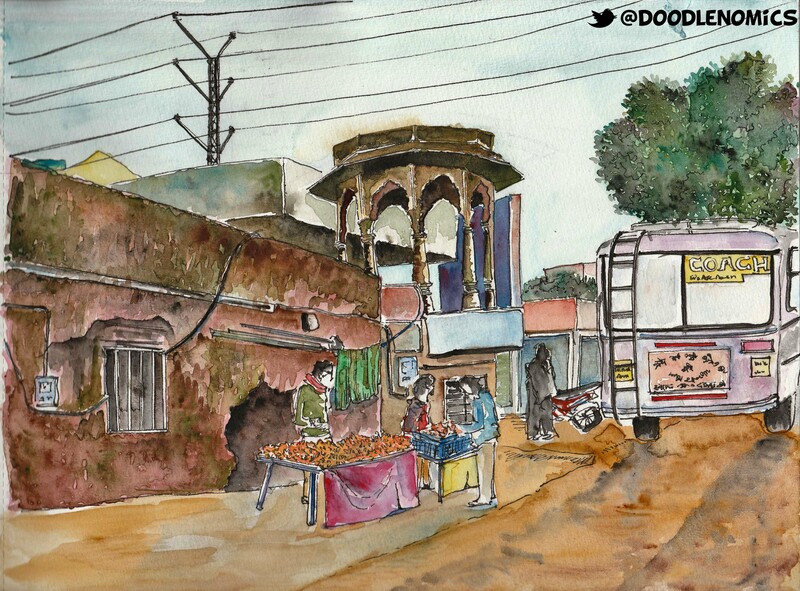 In this sketch, for instance, I loved how the old, discolored wall which is even broken in places, contrasts the fresh flowers and the character of the city perfectly illustrated in the haphazard banners and wires. On the way to Amer in Jaipur (Rajasthan, India). Watercolor on 200gsm paper. Next Post Win a personalized New Year Resolution Doodle!